Gears of War 3 Fenix Rising DLC Announced! January 17th will mark the release of the third piece of downloadable content for Gears of War 3. 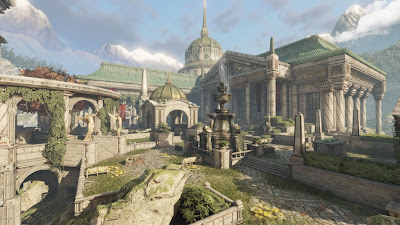 Titled Fenix Rising, the pack will feature five new maps inspired by locations from the game's campaign, and will also include four new character skins and a new system that allows players to rank up through level 100 multiple times to unlock exclusive emblems and weapon skins, essentially prestige mode for Gears 3. Re-Up Plasma – Animated flowing plasma in gold. Re-Up Omen – Shiny, red Omen. Re-Up Electric – Animated, golden electric shocks. When Fenix Rising is released, it will cost 800 MSP ($10) or a simple download if you have the Season Pass. The new maps can also be played in Horde and Beast too. The lineage of the Fenix family can be traced back along a distinguished line of military officers. Officer training at the Oracle Academy was simply the expected path for Marcus, and he had visited the grounds many times in expectation that he would walk the same path as his ancestors. But it was not to be, and Marcus broke with tradition to be with his best friends Dom and Carlos. Like any number of fine Seran traditions, the Academy is now lost to the invasion of the Locust Horde. The fortress of Anvegad was called Anvil Gate because its impenetrable walls were forged in the fires of war. Huge cannons sat atop battlements that guarded sprawling walls running the line of the UIR borders. Marcus went there to find Hoffman, and they both thought that Anvil Gate would offer protection from the incoming forces of Locust and Lambent. They were wrong, and little remains other than the ruined shell of a once mighty fortress. The excessive opulence of Azura defied all normal reasoning. But Adam Fenix could see the cracks in the veneer of splendor from the moment he arrived at this underwater processing center. And all that beauty mattered not at all once he was held captive by the Locust. Out of options, he had to find a way to contact Marcus, and finally reveal the truths he’d been keeping to himself for all these many years. Haldane Hall has been the home of the Fenix family for countless generations. But the only history that matters to Marcus’s are his memories of warm summer evenings spent with his mother, Elain, relaxing in the estate’s gardens. Sadly, all the estate’s history and beauty was lost when the Locust destroyed it in an attempt to kidnap his father. Convicted for insubordination and treason, Marcus was incarcerated in Jacinto Maximum Security Prison. Known as “The Slab”, this prison is not a correctional facility – it’s a place where Sera’s worst offenders are locked up and forgotten. The inmates are brutal, parole is not an option, and the average life expectancy is about two years. But that was before the Locust showed up, and what couldn’t get worse, suddenly did. Now your life expectancy there is around 2 minutes. Clayton was born a Gear, grew up a Gear, and on the very day he became eligible, he signed himself up to become the capable, confident, and devoted Gear he’d always known he could be. The Cole Train prefers to take the most direct path to the Locust Horde in any situation. What he lacks in finesse, he makes up in raw energy. Locust Marauders were the first to form any sort of organization outside of the Hollow – if their brutal infighting and bloodthirsty raiding parties could truly be called organized. The Savage Kantus were profoundly impacted by the loss of the Hollow. They have reverted to a primal, shamanistic state, and their battle cries have taken a dark, melancholy turn. Few sounds are as terrifying to human ears. Look for all this good stuff on January 17th of 2012!